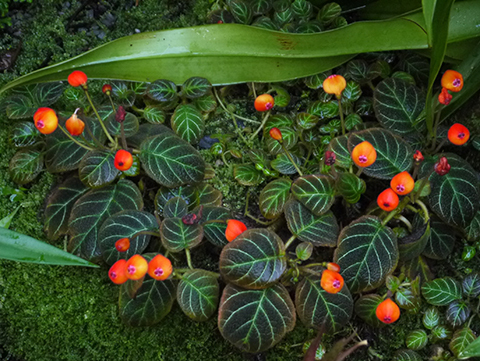 It's fun to watch visitors stop and do a double take when they see this small irresistible gesneriad (family Gesneriaceae, aka the African Violet family) growing on the mossy ridge above the dry stream bed in the Orchid Display House. Pearcea is a South American genus of 17 tropical species, only a few of which have similarly urn-shaped (or urceolate in botanical parlance) flowers. Species of Pearcea are mainly terrestrial understory herbs that grow in deep shade on humid moss covered slopes, where their spreading stolons create small colonies. Pearcea hypocyrtiflora is endemic to the Napo province of Ecuador where it grows in the vicinity of the Napo River at elevations below 700 m. It is not terrific subjects for windowsill culture. It much prefers the warm humid confines of a terrarium. Cuttings are easily rooted with Rootone in a conventional peat/perlite mix. The genus Parakohleria (which contains one of my all time favorite gesners, the mind-blowing Parakohleria rhodotricha) has recently been synonomized with Pearcea, a conclusion supported by molecular analysis showing Pearcea hypocyrtiflora nested within Parakohleria.